Support Aluminium structure for modules with stainless steel bolts . A choice between triangular structure and roof ( with under tile fixing ) . The installed solar panels generate electricity during the day. You consume part of the electricity, and the excess is stored in batteries for using at night. During the night is consumed what was accumulated during the day. If at any time of year, the cumulative production is not enough, the system takes energy from the grid. Consumption reductions can achieved over 90%. At the same time you can ask for a reduction of the contracted power, so savings are achieved in all terms of the invoice. Furthermore, the system is fully scalable, so if consumption is stable can raise a total network disconnection in medium term. Is it legal to connect batteries to the network? No, it is not, according to Article 11 RD1699/2011 in point 4 " In the circuit of generation to the measuring equipment shall not generating interleaved nothing other than the authorized facility or accumulation." The difference is that your home is no longer connected to the network. The network only acts as a source of emergency power, ie if you are not generating enough solar energy at a given time, the network provides this extra, but both facilities remain separated. What also makes possible in many cases to reduce the contracted power. In the particular case it is desired to directly connect the home to the grid , the system can automatically bypass. Assembly must be trust in an electrician. 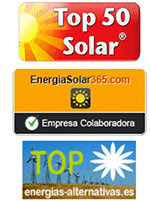 From www.tienda-solar.es we can support you or the installer that you specify. Hard question. The answer is yes, the reality is that 95 % of people do not. The reality is much faster than the government, and unfortunately, legalize this type of installation is a headache, as it costs about the same as legalizing a solar farm or an installation of hundreds of kW. Just when 100,000 such facilities are connected in Spain simplify the procedure will occur. Am I can completely disconnect from the network? The answer is Yes! Nut not immediately is best. It is best to start connected to grid and see the consumption we are saving, which depends much of our consumption pattern. The kit is expandable in all its components, so we can adjust the maximum consumption and generation. Once done, you can change that small percentage (which basically just gives us security of supply) by an auxiliary generator. If this option is not possible, you can opt for a second emergency battery bank. How I can know what should I install? The kit indicates the expected average daily generation (with modules south and inclined ~ 30 ° ), this generation will be slightly above the average consumption in our homes. The best way to know the average daily consumption is to look at our bills, it is a fact that tends to appear, if not you can always take the consumption of a representative period and divide by the number of days. • Install and maintain measuring a sufficient time so that the data are adequate. If you have a very similar consumption during all months of the year, with eight weeks will suffice. • Please send us the file measurements and last year electricity bills to soporte@tienda-solar.es. We will present a study on which kit is more suited to your needs. Indicating savings estimates and proposals on changes to services contracted to the electricity distributor (power cut, time discrimination, etc ... ). And an offer with the best discount. Directly and without doing anything, by saving kWh that we generate with solar, which comes in many cases to be higher than 95 %. Indirectly, because after further study can decrease the contracted power. In addition, most energy consumed will be at night, so you can opt for off-peak rates, getting a better price. Because we can study your particular case. Because we are experts in solar energy. Because we have the best prices in the market. Check it.